Let Timothy's of Newark host your next business or social gathering in our delightful Banquet Room, overlooking the scenic White Clay Creek. Timothy's experienced Catering Staff will assist you in planning your function right down to the finest detail - whether it be a Birthday Party, Business Luncheon, Retirement, Bridal Shower, Baby Shower, Rehearsal Dinner, Holiday Party, Brunch or Cocktail Party, Timothy's Staff can cater to all your needs. You may choose from our Banquet Menu, served entrées or a Buffet Menu, including our Exclusive Chef's Carving Station featuring the finest selection of meats available. 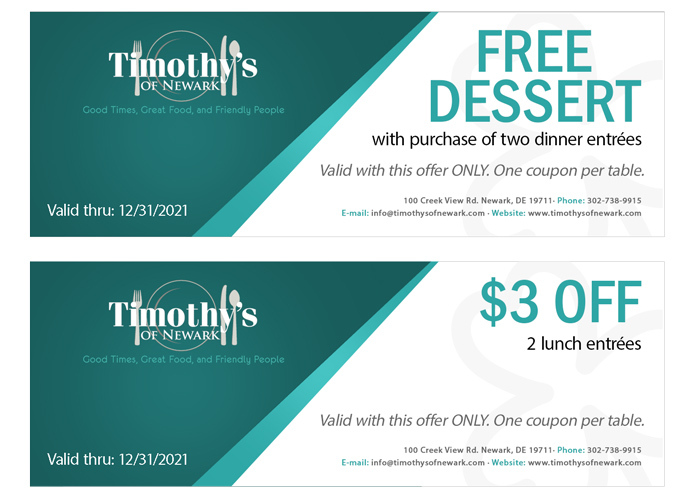 Inquire with our Timothy's Banquet Associate for more information about our Banquet Facilities. We have a wide selection of Hors D'Oeuvres, Party Platters, Brunch Buffet and Luncheon Buffet options to choose from. Timothy's offers take home party platters that make entertaining made easy. We provide multiple bar options as well as served dinner or buffet style dinner.